After our recent Hero Hostess Blog Hop at the beginning of the year, our fearless leader Deborah Nolan had the fantastic idea for each of us to make some thank you cards to send along to Hero Arts in California, to be distributed to the office and factory staff, to let them know how much we appreciated them. This is one of the cards I made. I got the idea to stamp in those open spaces between the flower stems from the cover of a Hero Arts brochure that advertised the new 2013 stamps. Whoever thought of this idea was genius! So after stamping and coloring the Tall Flowers stamp, I then gathered lots of Hero Arts thank you sentiments, and fit them into the spaces. If you'd like to see a video showing my Hostess Sisters' cards, and some photos of some of the employees at Hero Arts, please visit the Hero Arts Club Blog. Thanks so much for visiting today - I'll see you again tomorrow with a new sketch challenge at The Craft's Meow. If you're here to see my post for the current Simon Says Stamp challenge, please click HERE. "If I could turn back time".....that's the current challenge theme at A Blog Named Hero. 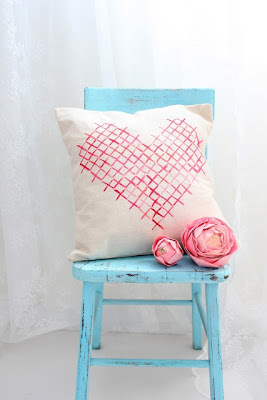 And today's my day to have a post there as one of the February Guest Designers! I adore shabby chic and vintage cards, and I had so much fun making this card today, using some of my favorite Hero Arts stamps. I started with a piece of paper from Pink Paislee's London Market paper pad, distressing the edges with my fingernail and then with antique linen distress ink. I overstamped some ferns using shabby shutters distress ink. The Etched Flowers were stamped and clear embossed on cream cardstock in Latte chalk ink., sponged with spun sugar distress ink and I used a spun sugar distress marker to darken some of the details slightly. The leaves and centers of the flowers were also colored in with markers, then I carefully cut them out and popped them onto my panel. The sentiment is from Friend You're the Best, and my seam binding was dyed with spun sugar distress ink. I also added some pale pink pearls from Hero's Blush Mixed Accents. Many thanks to Linda and Mary Dawn for having me as a Guest Designer this month - I love my Hero Arts stamps and love playing with them! Thanks for visiting! Happy Wednesday, friends - time for another Simon Says Stamp challenge and our theme again is Anything Goes. The Design Team and our Guest Designer Sem are playing with all things Tim Holtz. We'd love to see your creations using these products, too, if you have them. I stamped directly onto my kraft card, then paper-pieced the cupcake using Echo Park and Little Yellow Bicycles papers, and distressed the edges of my card using vintage photo distress ink. Since the stamp already has the word "birthday" on it, I just added the Simon exclusive Happy die. I stamped the Papillon cling background on white cardstock, embossed it in white, and then used these distress inks to sponge on some color: spun sugar, scattered straw, shaded lilac, and shabby shutters. After it was dry, I attached the panel to a white card base, and added some white seam binding, some die-cut butterflies, along with a spring sentiment and some pearls. There's another $50.00 gift voucher up for grabs for the random winner of our challenge this week. I just received some new Hero Arts stamps and inks recently and have been playing. This card uses the new Painted Flower stamp, which gives a diffused water-color look when stamped. I used bubble gum, cornflower, butter bar and field greens mid-tone inks. The sentiment is from an older clear set called Made with Love. I ran this stamped panel through a Cuttlebug Houndstooth embossing folder to give it a texture. Thanks for visiting today! Have a great one! I'll see you tomorrow for our weekly Simon Says Stamp challenge. Hello! I'm here today to share a card I made for The Craft's Meow Blog today. I used this beautiful flower from Nina's Beautiful Spring set, first stamping it all over the ivory background in tattered rose distress ink, and then again just once in black, clear embossing it, then watercoloring it with the same ink. I also watercolored the leaves using peeled paint and shabby shutters distress inks, then cut them out and popped them and the flower above the background panel. My sentiment is from Karen Baker's Lark Additions. Thanks for visiting today - hope you got some inspiration! Today is the day that our new February stamps are being released at The Craft's Meow, and it's our custom for the Design Team to have a Blog Hop using all of the new stamps! You should have arrived here from Julie Ranae's blog. For my first card I wanted to use this wonderful Bible quote from Nina's new Baby Shelf set. The adorable print of the little child and all of the patterned papers are from Graphic 45's Little Darlings paper pad. I stamped the sentiment, framed it and popped it above the rest of the card, then dyed some seam binding using stormy sky distress ink and made a soft bow, adding a button to it, and some pearls to my card. Karen's done it again: given us a set that can be used for all occasions. 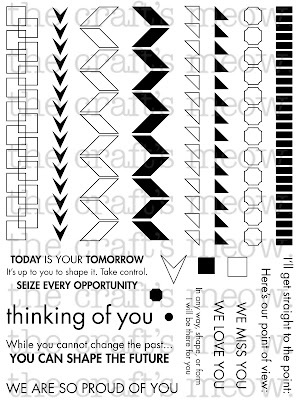 These arrow motifs are just one of 6 different geometrics that are in this set, and the sentiment is one of 9! You can now view and purchase the new February sets at The Craft's Meow Store! This month the new Soaring High set is your free gift with a $50.00 purchase from the store. Your next stop is at Lindsay's blog. Don't forget to leave a comment at each stop, because we're giving away all FIVE new sets to one lucky person! The deadline for comments is 8:00 PM PDT, Wednesday, Feb. 23. If you happen to get lost along the way, just go to The Craft's Meow Blog for a list of all the blogs participating and to see all 5 new sets revealed. If you're here to see my post for The Craft's Meow preview for today, please click HERE. I used Basic Grey's Lucille collection, concentrating mostly on the blues in it, accenting with black. My stamp is from a Simon exclusive set called Just a Love Note, and my arrows and hearts are wood veneers from Studio Calico. Heidi has, as always, provided a $50.00 gift voucher for the random winner of this challenge - will it be you? Need some ideas? Please visit the Simon Says Stamp Challenge blog to see what the DT and our Guest Designer Sem did this week. Before you leave, we would like to tell you about a fabulous Love Fest Event over on the Splitcoast Stampers Website. We are proud to be a Company Member and Simon Says Stamp is hosting Day 5 with a Die Crazy Challenge!! If you would like to join in then please hop on over to the SCS site for more details. To visit the Simon Says Stamp Company Forum, click HERE. Thanks so much for visiting again today! I have TWO new stamp sets to show you! They are Soaring High, by Nina Brackett, (which will be this month's free gift with a $50.00 purchase}, and Rejoice, by Kaitlin Ord Long. I got inky with the Soaring High set, first clear stamping and white embossing the beautiful dove, then using some blue distress inks to make a background by inking an acrylic stamp with them and spritzing with water, then "stamping" the block over my embossed bird. I wiped off the excess inks, then sponged on some extra faded jeans ink to bring out the details in the stamp. To finish I overstamped the sentiment in black. I was inspired by this wonderful sentiment in the new Rejoice set to make a rising sun design, using lots of different yellow and orange papers as my sun rays. I distressed most of the shapes with orange marmalade distress ink before gluing everything down to my yellow background. I hope you'll visit The Craft's Meow blog to see what my team-mates and our February Guest Designer Lynn Mangan did with these lovely stamps. Leave a comment at The Craft's Meow blog by 8:00 PM PST tonight for a chance to win BOTH of these new set! And I hope you'll visit again tomorrow for the full reveal of all 5 new sets for our February release, along with a blog hop showcasing them (and a chance to win ALL FIVE new sets)! When I saw these chevrons, I thought immediately of our nephew, who has just returned to Kuwait form a tour in Afhanistan, and made a military-inspired card to send to him. Both the solid and the outline chevrons plus the sentiment are in this set. For this card, I went the CAS route, stamping that squares motif twice, overlapping it, and then coloring it in with markers. Again, the sentiment is also in this set. Now I hope you'll visit The Craft's Meow to see what my team-mates and our February Guest Designer Lynn Mangan made with this set. While you're there, don't forget to leave a comment there by 8:00 PM Pacific time- a random commenter will win this awesome Geometric Foundations set! See you back here tomorrow for our reveal of our final 2 sets! LoveFest at Splitcoast Stampers: Die Crazy!! If you're here to see my The Craft's Meow post about our new February Release, please click HERE. The Keyword for our challenge beginning today is LOVEFEST2013E. Make a card using at least 1 die, label it with this keyword, and submit to the SSS gallery at Splitcoast Stampers. Post a link to your entry in THIS thread at SCS. You have until February 28 at 12:00 Noon Central Time to enter. 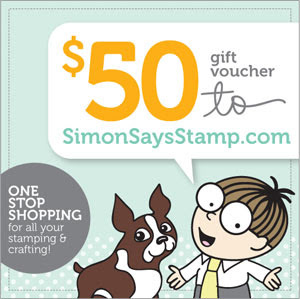 There will be 2 random winners of a $25.00 Ecard from Simon Says Stamp!! Welcome back to our 2nd day of our previews of new stamp sets being released this month at The Craft's Meow! Today my teamies and I are showing you the wonderful Easter Blessings set, designed by Karen Baker. This is a beautiful set that can be used for either Easter or Spring, with 3 darling images and many sentiments to go along with them, all in a beautiful script font. Today I chose just one of those sentiments, and paired it up with a flower from an older TCM set called Stitched Flowers to make you a spring card. I followed the TCM sketch for this month, too. I used a variety of papers from October Afternoon, Lawn Fawn, BoBunny, and Lasting Impressions, and added some pastel pearls.. If you haven't already, please visit The Craft's Meow blog to see what my team-mates and our February Guest Designer Lynn Mangan did with this lovely stamp set. Leave a comment at The Craft's Meow blog by 8:00 PM PST tonight for a chance to win this new Easter Blessings set! And please come back again tomorrow for another preview of one of our other new sets! Welcome to the first day of our new release previews of The Craft's Meow stamps! Today we're showing another of Nina's shelf series stamps called Baby Shelf. This set has been designed to coordinate with her Beautiful Shelf set. I used the shelf from Beautiful Shelf referenced above, and made a card for a Baby Girl. 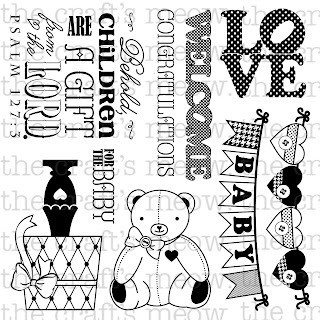 The lamp, Teddy, heart garland, and the sentiment are all from the new Baby Shelf set. My papers are Doodlebug Designs Sugar and Spice paper pad. I hope you'll visit The Craft's Meow blog to see what my team-mates and our February Guest Designer Lynn Mangan did with this set. Leave a comment there by 8:00 PM PST tonight for a chance to win this new Baby Shelf set! And please come back again tomorrow for another preview of one of our other new sets! I have been hanging on to this laser-cut square doily from a card I received years ago, and decided this was the time to use it. Keeping it the star of the show, I paired it with some scraps of paper left from my Simon February CardKit, using the sweet sentiment from the Just a Love Note set, and just added a peachy button and some white twine of my own..
Today is one of my favorite holidays; I've always been drawn to hearts and this is the day for them! So I hope you'll indulge me for one final Valentine - this one to all of you, who so faithfully visit and leave me lovely comments on a regular basis. I wish you flowers and chocolates, if that's your thing, and at the very least, the time to spend with someone you love, be it your hubby, your Mom, or your best friend. Sending Hugs to you all! I started with a piece of paper from My Mind's Eye Bramble Rose pad and built up from there, using my Cuttlebug machine for almost everything else on my card. First I embossed the trellis design (a cuttlebug embossing folder called Wicker Weave) on a vellum panel and attached that to my white-washed boards background. Next I die-cut some Sizzix Sizzlits Branch with Leaves and added them. The roses are My Favorite Things large and mini Rolled Roses. And to finish, I made a little banner using a sentiment from Hero Arts Friend You're the Best stamp set. Heidi has again provided another $50.00 gift voucher for the random winner of this challenge. I know you're going to fill the gallery with beauty this week! I wanted to highlight this beautiful doily that is included in the Simon February CardKit - the center of it is so delicate and unique. And I recently received this amazing Penny Black stamp called Bed of Roses. Yellow roses have always been my favorite, so that's how I colored these. I thought they'd look pretty against the Bazzill Stonehenge cardstock included in the kit. I glued the doily to my card, popped the trimmed roses at the top and added a banner with the sentiment from the Like Your Style stamps in the Kit. Pearls seemed the perfect touch to this feminine card. I don't think I need to explain anything......everything is in the kit except for that sentiment, which is from a Hero Arts set (CL583 Right at Home) and the cloud dies. I used HA Latte chalk ink to stamp.. Here's my entry for the current Tuesday Trigger - isn't it a great inspiration picture? Seems ages since I've played along at the monthly Hero Arts contest. 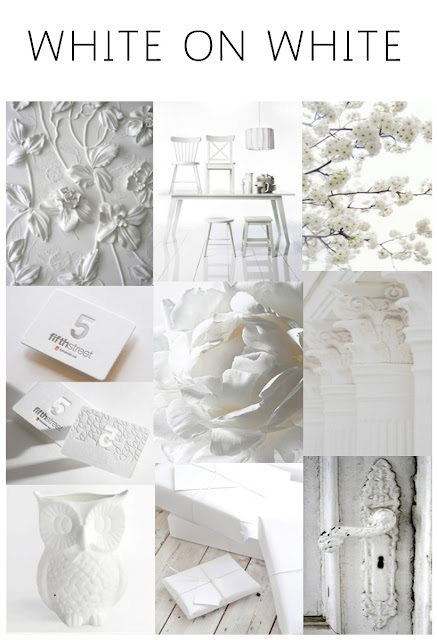 This month the theme is Love and Lace, and we have a sketch to follow also. The background paper is from Authentique's Lovely collection, and the stripe is from Simple Stories SN@P color vibe pad. My stamps are all Hero Arts, from these sets: AC002 Untitled Heart, CL564 Friend You're the Best, and the sentiment from CL586 XO. The felt button is from my stash, and I added those 3 tiny red hearts from Simon's Just a Love Note set in 2 different places. I stamped in Red Royal ink, a perfect match to the papers. You should give this contest a try! Each month Hero Arts gives away a $50.00 shopping spree to 10 judged winners and 2 random winners! Here's another card using the supplies in the Simon Says Stamp February 2013 CardKit. I decided to make a little flower bouquet with the adhesive buttons, and used the stamp set to make some tiny leaves to go with them. I pierced the adorable envelope to pull the long string attached to the tag through to the back, tying the ends into a bow, so that the tag can be inserted into the envelope and closed for mailing. Just look at all of the fun items in this kit! Such a fun set! Hello! Today is the day for our monthly blog hop at The Craft's Meow! Each month on this date we'll have a hop with a different theme; this month it's Valentines or Love. There are many stamps at The Craft's Meow that can be adapted to this theme, and this blog hop will hopefully give you some new and fun ideas. I love this little butterfly girl from Butterfly Kisses and for this card I stamped her in red. I also stamped the largest heart from Valentine Wishes, and cut it out, then covered the dandelion she's holding. I used a Nesties Labels Twenty die to cut her out, framed it, and then attached it to a white card along with a panel of printed paper from Doodlebug Designs Sweet Cakes. The sentiment is also from Valentine Wishes. And to finish I punched out some little red hearts. I know just who I'll be sending this to! Your next stop is at Lindsay's blog; I know she's made something sweet for you! And don't forget to leave a comment at the Craft's Meow blog, because one lucky person will win a stamp set of your choice! Happy Wednesday, friends! Wednesdays mean a new challenge at the Simon Says Stamp challenge blog, and this week our theme is "Have a Heart" - make a Valentine or use a heart on your creation. I really had fun with this one! I used my newest SSS die called String of Hearts, cutting out several different red prints from a doodlebug designs Valentine pad from last year, and "tied" it between 2 Small Forest Trees. Then I used the smallest hearts from Holiday Shapes to make my leaves, using both solid and dotted green papers. I stamped the sentiment from Just a Love Note using Hero Arts Red Royal mid-tone ink, and stamped my faux-stitched "grass" using Hero Arts Grass chalk ink. I originally stopped at that point, but felt that I needed something else, and then I remembered my new Studio Calico Birds wood veneer shapes.........I rubbed them right onto my barn door distress ink, let them dry a bit, then popped them onto my trees. Generous Heidi has given us another $50.00 gift voucher for the random winner of this challenge, to spend on whatever your heart desires! I can't wait to see what you make us this week! February sketch at The Craft's Meow!